Organizational control involves using strategy, tactics, and operational oversight to monitor and improve company processes. Organizations are built with the goal of profitability through processes in mind. The organizational control approach incorporates goals and the strategy used to reach them. Strategic management is a level of managerial activity below setting goals and above tactics. Strategic management provides overall direction to an enterprise. A tactic is a method intended to fulfill a specific objective in the context of an overall plan. Operational control regulates day-to-day output relative to schedules, specifications, and costs. Good managers have a broad vision of the process, a series of embedded tactics for efficiency and/or differentiation, and a careful operational control for cost control. operational planning: The process of linking strategic goals and objectives to tactical goals and objectives. efficient: Making good, thorough, or careful use of resources; not under- or over-consuming. Making good use of time or energy. vision: An ideal or goal toward which one aspires. Organizations are built with the goal of profitability through processes in mind. The organizational control approach incorporates goals and the strategy used to reach them. These strategies and tactics are developed with the foresight of specific operational objectives, such as market share, return on investments, earnings, and cash flow. As a result, organizational control consists primarily of reviewing and evaluating overall performance against the strategies, tactics, and operations used to define the organization itself. Tactics for organizational control are developed based on existing goals and strategies to establish specific objectives in the context of an overall strategic plan. Organizational control is essentially a benchmark, moving the company toward optimal levels of operation. 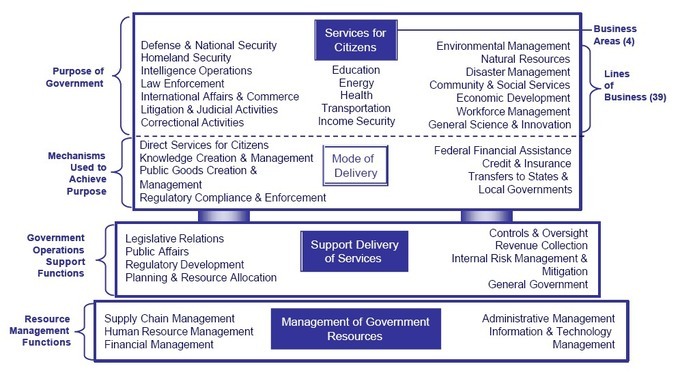 Example of management levels: The Government Business Reference Model shown here illustrates three levels of control: strategic (purpose), tactical (mechanisms), and operational (operations support). Strategic control includes policy-forming and -enforcing bodies such as the Department of Homeland Security and law enforcement; tactical control includes direct services such as financial assistance and credit and insurance companies; and operational control includes oversight bodies, revenue collection, and resource allocation. Strategic management provides overall direction to the enterprise. Strategy formulation requires examining where the company is now, deciding where it should go, and determining how to get it there. Strategic assessment involves situation analysis, self-evaluation, and competitor analysis, both internal and external, micro-environmental and macro-environmental. Objectives are determined by the results of the strategic assessment. These objectives should run parallel on a timeline, some short-term and others long-term. This involves crafting vision statements (long-term projections for the future), mission statements (describing the organization’s role in society), overall corporate objectives (both financial and strategic), strategic business unit objectives (both financial and strategic), and tactical objectives. These objectives should suggest a strategic plan that provides details (tactics) for achieving these objectives. One can see from this that strategy always comes first, followed by tactics. For example, a value-based commitment to environmentally responsible hospitality could be reflected strategically by working toward Green Globe certification and tactically by incorporating energy efficient appliances in the motel retrofit. Operational control regulates the day-to-day output relative to schedules, specifications, and costs. Are product and service output high-quality and delivered on time? Are inventories of raw materials, goods-in-process, and finished products being purchased and produced in the desired quantities? Are the costs associated with the transformation process in line with cost estimates? Is the information needed in the transformation process available in the right form and at the right time? Is the energy resource being used efficiently? Operational control can be a very big job, requiring substantial overhead for management, data collection, and operational improvement. The idea behind operational control is streamlining the process to minimize costs and work as quickly and efficiently as possible. Bureaucratic control uses formal systems to influence employee behavior and help an organization achieve its goals. Bureaucratic control empowers individuals relative to their position within the organizational hierarchy. For example, the chief executive officer of an organization has more power than a line manager. It is applied via systems of standardized rules, methods, and verification procedures. Control helps shape the behavior of divisions, functions, and individuals. Advantages of bureaucratic control include efficient decision-making, standardized operating procedures, and usage of best practices. Disadvantages include discouragement of creativity and innovation; dissatisfaction among employees; high employee turnover rate; and difficulty adopting to changing conditions in the marketplace, industry, or legal environment. bureaucracy: Structure and regulations in place to control activity. Usually in large organizations and government operations. hierarchy: An arrangement of items in which the items are represented as being “above,” “below,” or “at the same level as” in relation to each other. Bureaucratic control is the use of formal systems of rules, roles, records, and rewards to influence, monitor, and assess employee performance. Rules set the requirements for behavior and define work methods. Roles assign responsibilities and establish levels of authority. Records document activities and verify outcomes. Rewards provide incentives for achievement and recognize performance relative to goals or standards. Organizations use these systems when their size and complexity make more informal practices based solely on interpersonal communication and relationships impractical, unreliable, and ineffective. Bureaucratic controls are intended to help an organization achieve its goals by shaping how employees perform, creating accountability for outcomes, tracking actual performance, and correcting behavior when necessary. The biggest advantage of bureaucratic control is that it creates a command and control cycle for the business leadership. Decision-making is streamlined when fewer individuals are involved. Since standards and best practices are usually highlighted during decision-making, bureaucratic control makes an entire organization more efficient. One disadvantage of bureaucratic control is that it may discourage creativity and innovation by making an organization more standardized and less flexible. Business leadership may be versatile in some organizations, but it is not possible for a few individuals to generate all possible ideas or plans. This means that bureaucratic control can narrow the scope of possible ideas and plans. Another disadvantage is that the front- line employees may feel unappreciated and dissatisfied because they are not allowed to present their ideas; this can lead to heavy employee turnover. Often organizations with strict bureaucratic control find themselves less able to adapt to changes in the marketplace, their industry, or the legal environment. Bureaucratic control: An example of a bureaucratic feedback system is the military, with its strict hierarchy and clear chain of command. Though bureaucratic organizational structures may seem less desirable than flatter structures, they are necessary at times. While software development may benefit from a more autonomous structure, for example, other industries benefit from the tight controls and tall hierarchies of bureaucratic control. Control uses information from the past and present and projections for the future to create effective control processes. Feedback is a process in which information about the past or the present is used to influence the present or future. Concurrent control is active engagement in a current process where observations are made in real time. Feedforward refers to giving a control impact to a subordinate or an organization from which you are expecting an output. It is predictive because it is given before any deliberate change in output occurs. Monitoring and controlling is a set of processes implemented to monitor project execution to discover and solve problems or potential problems in a timely manner. feedforward: To respond in advance. concurrent: Happening at the same time; simultaneous. feedback: Critical assessment on information produced. In management terms, control means setting standards, measuring actual performance, and taking corrective action. Control involves making observations about past and present control functions to make assessments of future outputs. These are called feedback, concurrent control, and feedforward, respectively. Feedback is a process in which information about the past or the present is used to influence the present or future. 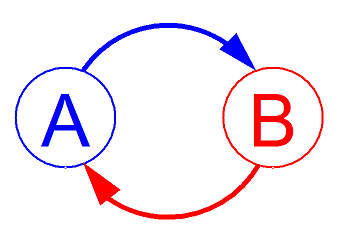 As part of a chain of cause-and-effect that forms a circuit or loop, actions are said to “feed back” into themselves. Feedback helps an organization seeking to improve its performance make the necessary adjustments. Feedback serves as motivation for many people in the workplace. When employees receive negative or positive feedback, they decide how to apply it in their daily work. Feedback for the system as a whole also provides common points of discussion for management and allows for a holistic appraisal of how processes can be improved. 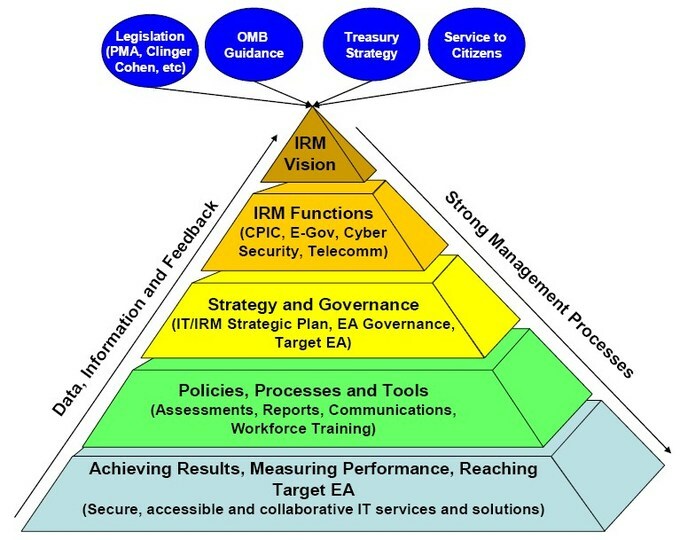 Example of the information feedback process: This image shows how data, information, and feedback flow throughout a management strategy. Concurrent control is active engagement in a current process where observations are made in real time. A set of processes are implemented to monitor project execution to discover and solve problems or potential problems in a timely manner. Picture a floor manager actively measuring each component of the operation with a checklist to identify issues as they occur. Feedforward is a management and communication term that refers to giving a control impact to an employee or an organization from which you are expecting an output. Feedforward is not just pre-feedback, because feedback is always based on measuring an output and sending feedback on that output. Pre-feedback given without measuring output may be understood as a confirmation or just an acknowledgment of control command. Feedforward is predictive in nature. Picture an analyst statistically measuring the quality and quantity of a given output based on information gathering. The control process can be hindered by internal and external constraints that require contingency thinking. TOC asserts that throughput would be infinite if there were no constraints within a process. Therefore, constraints are a constant consideration for management control. Internal constraints include people, policy, and equipment issues, which can actively reduce the efficiency of specific process flows. External constraints include resource scarcity, contracts (i.e., suppliers or employees), and legalities. control: Influence or authority over someone or something. throughput: The movement of inputs and outputs through a production process. All processes are susceptible to constraints; the theory of constraints (TOC) postulates that “the chain is only as strong as its weakest link.” Because systems are interdependent, it makes sense that an entire set of processes within an operational paradigm can be made vulnerable to failure by a single process that is struggling. TOC assumes that throughput, operational expense, and inventory are the three central inputs in a given system. TOC relies on the assumption that there is always room for improvement in these inputs–after all, if there was nothing preventing the system from achieving higher throughput, throughput would be infinite. This means that any time organizations encounter substantial internal or external constraints, it is the role of management to create a strategy to circumvent them. Since throughput is never infinite, this is an ongoing process. Equipment: The way equipment is used limits the ability of the system to produce more salable goods/services. People: Lack of skilled people limits the system; mental models also cause negative behaviors that become constraints. Policy: A written or unwritten policy prevents the system from making more goods/services. The list of potential internal constraints is long: employees may not have the proper skills to use specific types of equipment, policy may organize the processes in an imperfect manner, equipment may depreciate faster than expected, employees may be absent or inefficient, policy may limit resource allocation to inventory and warehousing, etc. Internal constraints are a constant concern for the managers who must try to minimize them by continually optimizing the system. For example, if employees lack specific skills, management may want to refine its hiring policies. 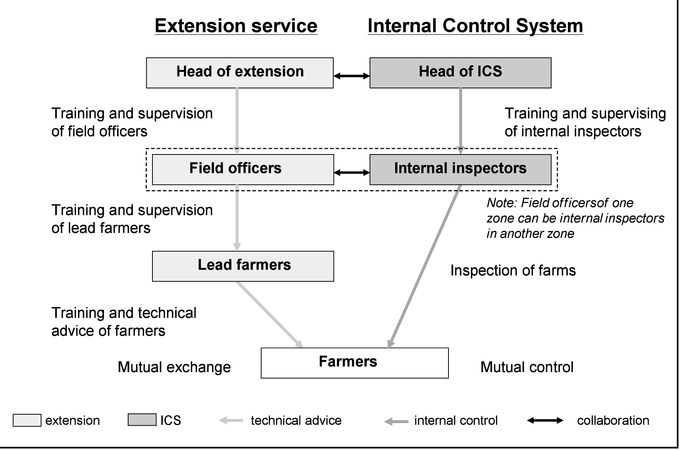 Internal control system: This flowchart illustrates how an internal control system can be integrated into the production process: mid-level managers of one department can monitor and QA other departments’ output. The first external constraint, resource scarcity, refers to the limited availability of essential inputs (including skilled labor), key raw materials, energy, specialized machinery and equipment, warehouse space, and other resources. Moreover, managers often face constraints on plant capacity that are exacerbated by limited investment funds available for expansion or modernization. Contractual obligations also constrain managerial decisions. Labor contracts, for example, may constrain managers’ flexibility in worker scheduling and work assignments. Labor contracts may also restrict the number of workers employed at any time, thereby establishing a floor for minimum labor costs. Finally, laws and regulations have to be observed. Legal restrictions can constrain production and marketing decisions. Examples of laws and regulations that limit managerial flexibility include: minimum wage, health and safety standards, fuel efficiency requirements, anti-pollution regulations, and fair pricing and marketing practices.